Burnley's Andre Gray (left) and Hull City's Harry Maguire battle for the ball during the Premier League match at the KCOM Stadium, Hull. PRESS ASSOCIATION Photo. Picture date: Saturday February 25, 2017. See PA story SOCCER Hull. Photo credit should read: Mike Egerton/PA Wire. RESTRICTIONS: EDITORIAL USE ONLY No use with unauthorised audio, video, data, fixture lists, club/league logos or "live" services. Online in-match use limited to 75 images, no video emulation. No use in betting, games or single club/league/player publications. 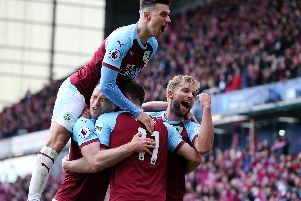 Clarets striker Andre Gray has stressed the importance of staying unbeaten against their rivals in a bid to avoid being sucked in to a battle for survival in the Premier League. Burnley started a string of four away games with a 1-1 draw against Hull City at the KCOM Stadium and now move on to the Liberty Stadium to take on Swansea City, who have turned a corner under Paul Clement. The Clarets hold a seven-point advantage over the Swans while Leicester City’s win over Liverpool on Monday now means that the gap from the bottom three stands at nine points. Questioned on how crucial it was to avoid defeat, Gray said: “It’s massive, especially when we’re playing the teams around us. It’s good to keep them out of touching distance. It’s important not to lose, try to get the win but if not just don’t lose. “We’re nearly into the last 10 games now so we’ll keep plucking away. The results went for us so we’ll just keep doing what we’re doing and I’m sure we’ll be fine. He added: “We know that there’s a lot of work to do, it’s not over yet, we know that we’re still in that relegation battle so we’ve got to keep our heads down, keep working hard and hopefully it’ll go our way. “Hopefully we can [secure survival soon]. With a few more wins, avoid losing and just keep plucking away.